An introduction to dry-point printing using a variety of techniques, including copper plates. Our printmaking short courses aim to familiarise you with the studio environment in a friendly atmosphere. The workshops introduce you to the unique possibilities inherent in printmaking processes, with a technical focus on monotype, relief and Intaglio techniques. Included is a focus on printmaking materials, equipment and OHS. Historical moments in the evolution of printmaking are highlighted according to what methods of printmaking are being delivered. Please bring a sketchbook, pens, pencils and apron (all other materials supplied). Jimmy Pasakos has been a professional artist for over 30 years. 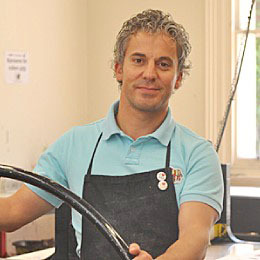 His core methods are in printmaking, drawing and mixed media. In his teaching, Jimmy encourages people to explore their artistic expression through the many varied methods possible in printmaking.